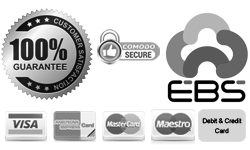 We accept all Visa,Mastercard,Maestro for online orders through our secure checkout. This is the fastest and easiest way to place your Roboshop Order, and most of our customers choose to order this way. For maximum security,your credit card number is encrypted with high-grade 256-bit encryption while it is sent over the internet directly to our credit card processor. Your credit card number is never stored on our servers, and it is not visible to us in any way. Orders recieved by 5 PM on business day will be shipped the same day,orders recieved afer that time will be shipped the next business day. We will send you confirmation email with your package tracking number (if available) after we ship your order.